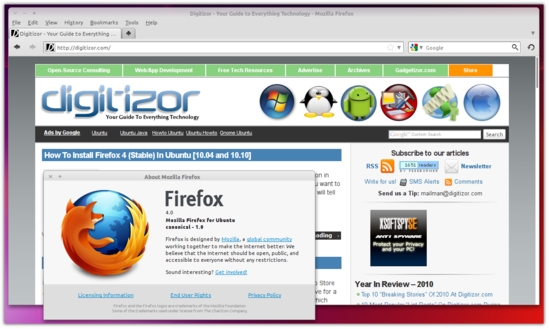 Earlier we wrote a post on how you can install Firefox 4 development version in Ubuntu. Today the stable version of Firefox 4 has been released. So, if you want to install a stable version of Firefox 4 instead of the development version, we will tell you how you can do that in this post. If you are not using the development version, skip this step. 2. Now add the Firefox stable PPA. 4. Finally install Firefox 4 with the command. After installation, you will find Firefox under Applications > Internet > Firefox Web Browser.